Mexican wedding cakes or cookies are one of Mexico’s famous baked goods..Here is my Noble version. I love them and this was one of my most shared recipes (289 times) on my Facebook page because they are so simple to make, comforting and a crowd pleaser. One of those recipes that can’t go wrong. You can adapt them and make them as you can see: vegan and gluten free also. Feel free to swap the pecans for walnuts or almonds. You can experiment adding spices or orange or lemon zest as well. I would love to hear about your baking and how you like this recipe. Please share your ideas or questions in the comments (below recipe). Line 2 half sheet baking pans with Silpats. Preheat oven to 340 F.
In a Kitchen Aid mixer with a paddle attachment cream butter and sweetener with vanilla and salt until blended and soft. Add the pecans, flour and mix until combined and an even dough is formed. With your hands shape cookies into balls of aprox 10 -11 gr each. Place on baking tray leaving enough space. Note: cookies made with certain gf flours might spread a bit more. Bake until barely very lightly golden. Remove from oven, let cool completely. Put cookies onto a tray with paper towels, to drain excess fat. Put cookies on a bowl with Swerve Sweetener Confectioner’s Style Sugar and coat evenly. Store cookies in a cookie jar or cookie tin or plastic containers (I recycle my pre washed salad containers, these are excellent storage containers for baked goods). 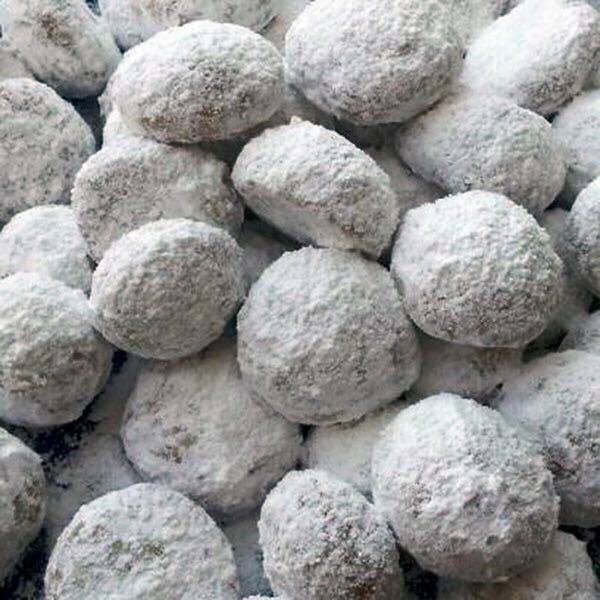 OMG, these mexican wedding cookies look so delicious. I was leary as I loved Mexican wedding cookies but since I’ve been Keto gave it up. These are so good, as close to the real thing. I’m hooked. I did use Lakanto sugars instead of the swerve but it still turned out amazing! Hi Lisa! Wow thanks so much! I love reading messages like these! I am so happy to hear that! I love Lakanto! Did you use the powdered one or the classic? Happy Baking! Hey Buddy!, I found this information for you: "MEXICAN WEDDING COOKIES". Here is the website link: https://www.vanessamusi.com/mexican-wedding-cookies/. Thank you.